I grew up in the BEAUTIFUL state of Oregon, and so I love love LOVE the Oregon Coast. I have so many amazing childhood memories that I wanted to share with my kids. We actually went to the Oregon coast for our honeymoon 14 years ago and went back for a family trip 8 years ago… but it has been way too long! This year I was determined to not only take a well deserved family vacation (it had been 5 years since our last one) but to head to the coast again. BUT the coast can be expensive, ESP trying to find a place that can fit a family our size! 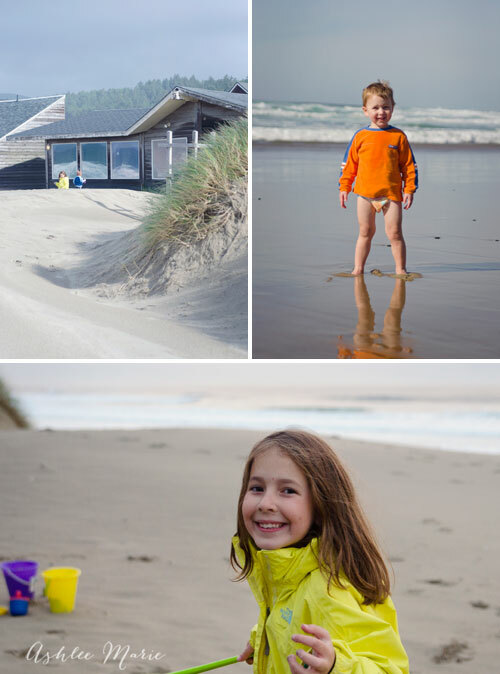 We looked through a few HUNDRED options for the Oregon coast I decided to dream big and search for homes RIGHT on the beach, like walk out the door onto sand… With 5 kids even crossing the street to get to the beach can be a pain, and it changes the dynamic of the vacation. You KNOW what I mean, you can’t just go in and out, you have to gather all your stuff and go out and in all together. And then you want to stay out as long as possible so you kind of push it until everyone is READY to go. When your right on the beach and can go in and out, grab toys, snacks or even a coat when you need it easy? so much better! The best thing about this house is the windows, the entire west side of the house is windows. The view are AMAZING and seriously I couldn’t get enough of these windows. 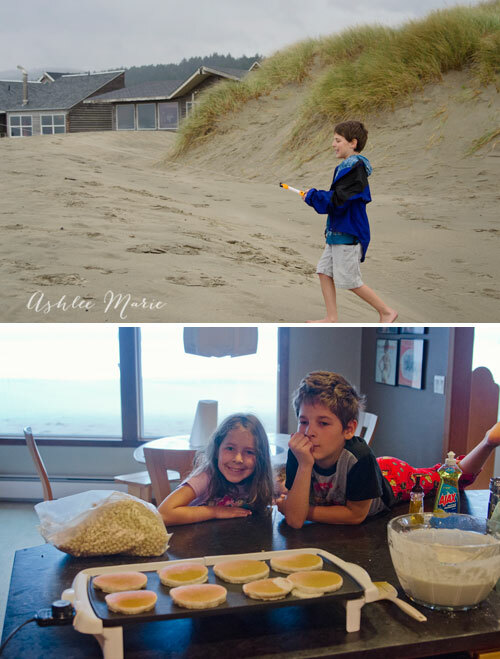 I enjoyed just sitting in the dining room, living room or family room watching my kiddo’s play, watching the sand blow across the dunes, enjoying the cloudy sunset and watching the boats at night. But besides the windows the entire house was just amazing. Not only was the location a dream come true but the interior was updated and just incredible. 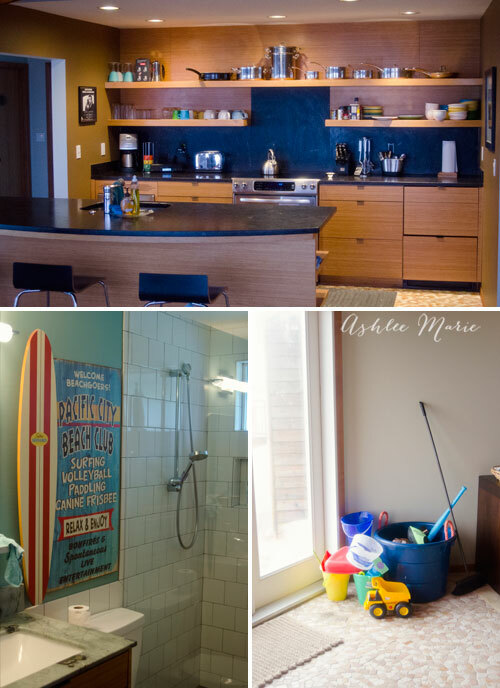 The kitchen was AMAZING, the bathroom had heated floors (divine) it was warm and cozy and had EVERYTHING we needed (including beach toys so we didn’t have to buy items we don’t own)! I know a lot of people might think I’m INSANE, but I LOVE having a kitchen on vacation. Not just because it’s cheaper to make lunches out of a kitchen instead of eating out, but because I LOVE cooking and baking. When I’m at home there are always so many things that need to be done, piano, homework, shopping, blogging, photography, etc… so I don’t ALWAYS get to enjoy everything I make for meals at home. BUT on vacation I get to just ENJOY my time in the kitchen! It’s relaxing and enjoyable and we eat SO well on trips! If you follow me on instagram you can see we ate WELL all week: pork chops, salmon, alfredo, coconut pancakes, french toast, brownies and lots and lots of homemade hot chocolate!! It was wonderful! What do you enjoy best about vacations? I love getting away from it all, being a stay at home mom that has turned into a work at home mom has been a tough transition! I love love LOVE what I do, but it’s sometimes hard to step away when it’s always right there waiting for you. So this trip was just what I needed, finding my dream vacation home for an affordable rate was such a bonus. Getting to travel to my favorite place and share it with my children was something I won’t soon forget. Making memories as a family is HUGE and I’m so glad we took the time and money to do it. We all needed this time together, no fighting, just playing and relaxing! No deadlines, no pressure, seriously I need more time away. My plan was to take all of December off…. BUT I have a huge huge HUGE new project (no it’s not a baby this time) that I can’t WAIT to share with you guys so this beach vacation is going to have to keep me going a bit longer. 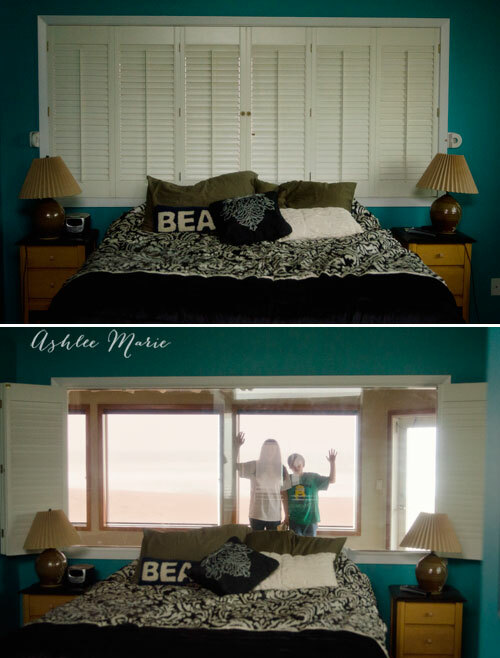 And finally… each location has something really memorable about it, not only did the entire west side have windows with amazing views… but the Master bedroom had this AMAZING window as well! You could close it for privacy (let’s face it, with 5 kids we don’t really get much of THAT). and open it for incredible views! It was just a fun touch that I loved. I’m counting down to the next time we can get away from it all, this location is on the top of my list next time we make it to Oregon! Wow! This looks absolutely amazing!!! I’ve always had issues with trying to find options for multiple families or locations that allow you to truly experience the city, so I can’t wait to look into airbnb! Thanks so much! I love airbnb! I will use it from now on for every family vacation! This looks like too much fun! Husband and I used AIRBNB to find a little room for one night in Australia! It worked out amazing and we loved it. We need to use it more in the states! I’ve been dying to try airbnb! Some of their locations on Instagram are just swoon-worthy! even just using it for a staycation would be fun, but it makes traveling far so much more affordable, and exciting! Sounds like such a fun time! It was nice to learn about AIRBNB as well! That looks incredible!!! I’ve never been to the Pacific Northwest, so it’s on our list. Love the house you found on Airbnb. Looks fabulous! What a great post! I haven’t heard of airbnb before, but I’ll definitely check them out–your vacation looks amazing! This looks like so much fun! 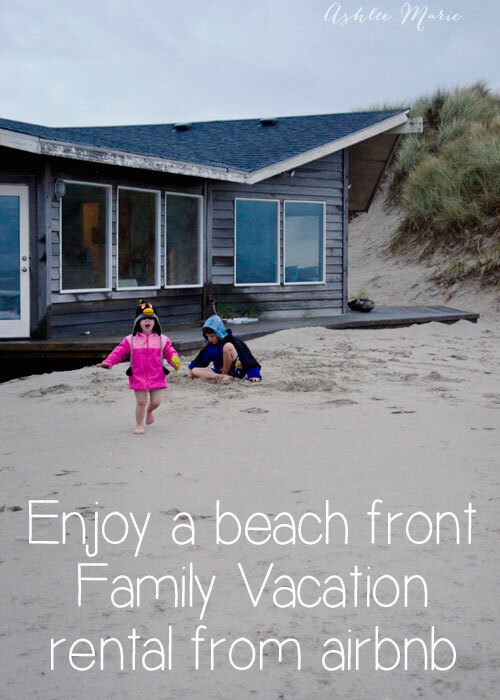 We love the beach and would love to stay in a beach front home like this! That looks like a great vacation spot! I haven’t heard of airbnb before! Love this! 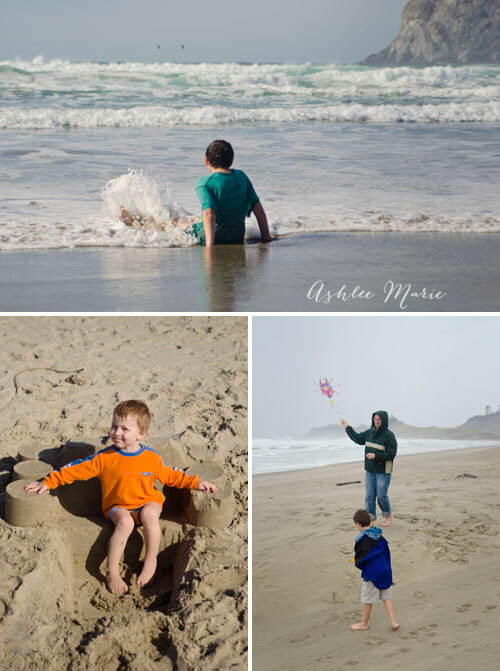 We’re dying for a family trip soon- I love seeing your pics! I had never heard of this! Thanks! Off to check it out! hope you give it a try! seriously amazing for vacations! That looks like it turned out to be an awesome family vacation. Air BnB rocks! You can really find some awesome one of a kind places to stay. Great photos too! it was a great trip – I’d go back every year if I could! The Pacific Northwest offers some awesome coastal experiences and it looks like you found a great one! Wow! Staying right there on the sand! Nice photos too.